John Pope giving the "sign of the beast" in David Farrant's home. Bishop Manchester spoke to this left-wing, liberal journalist just once, only to discover himself seriously misrepresented and indeed misquoted by Duncan Campbell. Mr Farrant somehow managed to convince Mr Campbell that the bishop belonged to the old guard of illiberal-minded reactionaries. Such folk were already by that time an endangered species, but it was enough to alienate Duncan Campbell against Bishop Manchester. Yet before Mr Farrant fully boarded what became a black magic bandwagon, he was yet to disembark from his vampire bandwagon. Curiously, his lieutenant John Pope would not set foot near Highgate Cemetery and, during the suspected vampire contagion, steered well clear of the infamous graveyard. His collaborations with Mr Farrant took place in lonely woods and a derelict house notorious for its diabolical history. But Highgate Cemetery remained off limits for John Pope. Not so Mr Farrant who ventured into that Victorian graveyard to first hunt the vampire and then to summon it by using what ostensibly must be regarded as black magic. 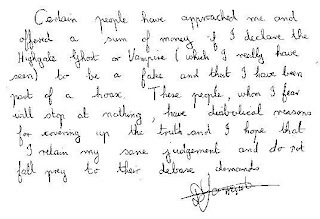 Despite the note being signed and written in Mr Farrant's very recognisable handwriting, when questioned about its authenticity more than a quarter of a century later by Gail-Nina Anderson before an audience at the Fortean Times UnConvention, 20 April 1996, David Farrant denied ever writing the note. It is “a phoney,” he told the audience. He was, of course, lying. The note (shown above in facsimile), of course, is authentic, as any comparison with Mr Farrant's correspondence demonstrates. Below is another facsimile, this time of a letter on headed prison notepaper from David Farrant (now returned to calling himself “A D Farrow”) to the president of the British Occult Society. Mr Farrant’s prison correspondence contradicts and gives the lie to later claims, not least those about his relationship with Bishop Seán Manchester and the British Occult Society. 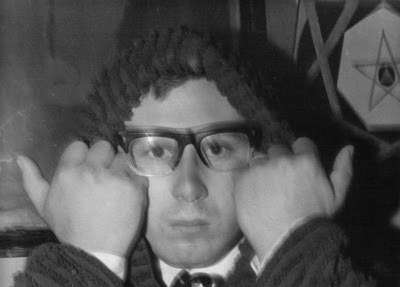 Written three days before it was posted on 21 August 1970 from Brixton Prison where he was being held on remand for psychiatric reports, David Farrant’s own statements leave no doubt where he stood in relation to what was happening. The psychiatric reports would prove inconclusive. It could not be agreed whether he was sane or not. He was nonetheless judged fit to appear in court. According to the scores of tracts and pamphlets self-published by Mr Farrant from 1991 until the present-day, he claimed to have “founded” the British Occult Society in 1967, and by 1970 his “investigations” were supposedly three years old. This is clearly not the case when reading his prison correspondence of August 1970. 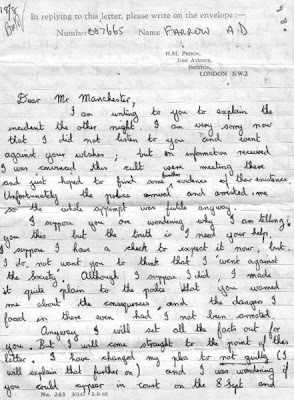 David Farrant’s letter explains that his arrest was the result of not listening to Bishop Manchester's public warning to him, and others engaged in similar behaviour, to not interfere with the ongoing investigation being carried out by the British Occult Society. Farrant then claims to have information about a cult meeting in Highgate Cemetery. This did not prevent him entering it with a cross and stake, however, which he overlooks mentioning. He apparently wanted “to find some further evidence of [the cult’s] existence.” He admits going against the wishes of the Society and Bishop Manchester. Then he promises to forward all the facts about his lone escapade; something he apparently did not do. Mr Farrant reveals that he has now changed his plea to the court from one of guilty to not guilty, and requests Bishop Seán Manchester's appearance as a character witness to speak on his behalf. He expresses concern over how the court might react when they realise he sought publicity in connection with Highgate Cemetery over the six months prior, and now wants the bishop in court “to say you have warned people” about the very behaviour he had engaged in. He claims to appreciate that Bishop Manchester is “a busy man,” but nonetheless would like the bishop to visit him, or, at least, send somebody else. He then asks for Bishop Manchester's advice, concluding his letter with the following statement: “Well that’s all, please forgive me for being in this trouble and having to ask your help. I would be grateful if you could write immediately.” Bishop Seán Manchester did not write, nor did he allow himself to be exploited for Mr Farrant's court case with the inevitable media coverage to follow, but he did visit Farrant at Brixton Prison. The visit left Bishop Seán Manchester in no doubt that David Farrant was trying to rope him into some sort of dubious attention-seeking scheme, and wanted it to be made all the more plausible by what might be seen as the bishop's seal of approval. He was told in no uncertain terms that it was not going to happen. The case against Mr Farrant on this occasion was dismissed because Highgate Cemetery, in the strict sense of the wording of the charge, is not an enclosed area, and Mr Farrant had been accused of being found in an enclosed area for an unlawful purpose. Thereafter Mr farrant continued to seek attention and make a general nuisance of himself. But, as we know, David Farrant was still with his wife, Mary, in March 1969, albeit awaiting bankruptcy and eviction, and she would later state under oath that nothing of the kind occurred. 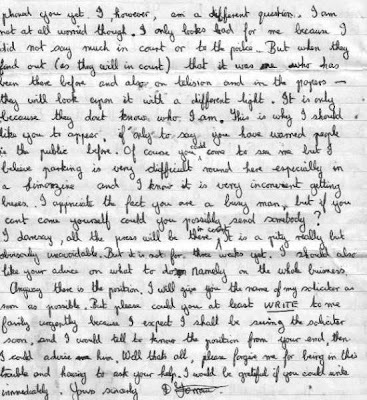 The prison letter sent in 1970 is further evidence that Mr Farrant’s self-serving claims are utterly fraudulent. His first pamphlet contains fifty stolen lines of text from Bishop Seán Manchester's The Highgate Vampire, a trend Mr Farrant would continue in his future tracts where further text and photographs stolen from the bishop's books are unlawfully reproduced. This would expand to theft from glossy magazines and internet websites from which source images of Bishop Manchester would be reproduced without permission and then given false attributions alongside poisonous fabrication which occasionally strayed into areas that can only be described as bizarre. David Farrant invented a completely non-existent history; including anecdotes that often mutated and contradicted previous claims. Only recipients who require absolutely no evidence were at risk of being influenced by David Farrant's endless stream of malice, and it is perhaps surprising to learn that these include some members of the James Randi Educational Foundation Forum, academics attached to universities, and, of course, journalists. This appraisal was reached after the journalist met Mr Farrant to interview him on a couple of occasions plus Peter Hounam's own newspaper’s coverage of David Farrant’s trials at the Old Bailey. Bishop Seán Manchester came to know Mr Farrant in the 1970s better than any journalist and, albeit fully aware the publicity-seeker was an arch-deceiver, learned enough to separate the wheat from the chaff. It is for that reason the bishop's writings on David Farrant are an excellent resource. Most who have actually met David Farrant have similar comments, which makes it all the more baffling when some people take him at his word, but always without doing any meaningful research. When tackled on this they merely shrug their shoulders and say that they did not have access to the relevant documents. Questions nonetheless remain as to whether David Farrant is just “a little devil” or the Devil Incarnate (the term means evil personified and not the Antichrist; though, in Bishop Manchester's view, Mr Farrant definitely fits the description of “an antichrist” in the sense that he is against Christ), although he prefers in David Farrant's case the description Devil’s Fool rather than Devil Incarnate because Mr Farrant always strikes people as being too pathetic to be a real threat. He nevertheless remains an inveterate liar who does not believe in his own rectitude, and his extremely negative influence is quite obviously harmful. Bishop Seán Manchester has opined on innumerable occasions that David Farrant became demonically oppressed in 1971, developing two years later into possession where he betrayed a wasting of the frame, aggravated and irritable moods, a peculiar complexion and features which evince hatred, anger, insult and mockery combined with associated facial contortions and grimaces. His nervous stammer existed prior and is not directly attributable to his demoniacal state. He has a weak bladder, requiring a rubber sheet for his mattress. This, too, existed well in advance of his dabbling in the occult and has no relevance. So what does Mr Farrant himself claim about his early life and that infamous period when he invited a satanic force to enter him while conducting a necromantic ceremony with a naked female in the dead of night at Highgate Cemetery, and undertook to raise demons with black magician John Pope in a house reputed to be possessed of evil? He self-published in 2001 an autobiographical booklet titled Dark Secrets which can be used to draw upon for Mr Farrant's version. Even so, the paucity of detail on pivotal events leaves us knowing less about him after reading his autobiographical account than before, requiring researchers to look elsewhere to discover Mr Farrant’s actual comments on crucial matters. Some key figures do not get mentioned at all while Bishop Manchester invariably attracts the mandatory catalogue of misrepresentation, defamation and fabrication. The Vampire Hunter’s Handbook by Seán Manchester (Gothic Press, 1997, p89). The Highgate Vampire by Seán Manchester (Gothic Press, 1991, p105) quotes Donald F Glut’s use of the Reuters report. Beyond the Highgate Vampire by David Farrant (British Psychic and Occult Society, 1991, p5).